I’m not ashamed to admit that the first time I saw Squirm was on the infamous Mystery Science Theater 3000 episode. Growing up in Minnesota in the 1990’s, MST3K introduced me to many horror, cult, and science fiction titles that I may otherwise have never seen. And like many of those films that were so hilariously “riffed” on the show, I would come to appreciate Squirm with and without the riffing. It may not be the most polished Horror production, but it’s damn creepy and certainly charming with its low budget southern atmosphere. In Squirm, Don Scardino plays Mick, a young man on his way to Fly Creek, Georgia when the bus that carries him can go no further due to the flooding in the area, a result of a recent thunderstorm. Mick makes his way through the swampy terrain on foot to see his darling girlfriend Geri (Patricia Pearcy), intending to stay awhile with her family as he gets to know Fly Creek and it’s stand-offish inhabitants a little better. Little does Mick know that because the power lines were knocked down in the recent storm, the resulting electricity has given the worms in the soil super strength and general ferocity, and soon the townsfolk are up to their elbows in mutant creepy crawlies of all shapes and sizes. Corpses begin to appear around town with their flesh ripped directly from the bone, worms slither out of showerheads and through people’s faces, among other creepy shenanigans. With little help from the local Sheriff (Peter MacLean) and time running out, Mick and Geri launch their own investigation into why the worms have invaded their town and concoct a plan to stop them. Revisiting Squirm after many years was a delight in more ways than one. Sure, the film has the B movie stamp written all over it, with a generally low budget feel, some shoddy editing, and supporting players that seem to have been cast right out of the produce section at the Piggly Wiggly. But this film has oodles of charm! The main cast truly gives it their all, making their down-home characters quite believable in an otherwise ridiculous scenario. The gross-out effects from a then relatively unknown Rick Baker are a delight as well, providing plenty of barf bag moments for viewers (especially if you’re sensitive to our slithery soil dwelling friends). Squirm fits right in as part of Scream Factory’s ever-growing line of Horror treats, and I enjoyed revisiting the film on this brand new Blu-Ray edition. It’s safe to say that you’re going to be quite astonished at how incredibly good Squirm looks on Blu-Ray from Scream Factory. Going in, especially with its low budget nature, I prepared myself for a likely rough-looking presentation, but I couldn’t have been more wrong. This High Definition viewing experience provides one of the cleanest transfers of a low-budget Horror film I’ve ever seen on the format. The print provides authentic natural film grain that is ever present and without any signs of digital manipulation. Colors look period-accurate and maintain stability throughout, fine object detail is shockingly pristine in most cases, and there is nary a scratch or blemish to be seen. It’s incredible, and slightly fascinating as to how the hell this looks so good on Blu-Ray. The 2.0 DTS-HD Master Audio mono track is more in line with my expectations going in, but that’s not to say it’s a disappointment in the slightest. Dialogue is always crystal clear and the track has some oomph thanks to the HD upgrade. The score and background effects balance is slightly limited, sometimes wavering in its ability to present the audio without a “tinny” or ringing dynamic attached. Given the nature of the film, it really does sound just fine, and any limitations are likely the result of the original audio source. Audio Commentary with Writer/Director Jeff Lieberman– Director Jeff Lieberman gives an in-depth and focused commentary here, providing an insightful listening experience for fans of the film. In between discussing the cast, special effects, and filmmaking techniques, Jeff is pretty funny as he naturally reacts to scenes from the film (including goofs, plot logic, etc.). Jeff talking about calling into a local television station that chose to play Squirm in black and white is especially fun, as he called not to complain but to praise them because he loved how the film looked! This is an insanely fun commentary to listen to. Digging In: The Making of Squirm- Lasting roughly 33 minutes, this brand new documentary from Aine Leicht and the folks at Shout! Factory provides fans of the film with plenty of fascinating behind-the-scenes stories, production details, and fun memories from the cast and crew. Director Jeff Lieberman and actor Don Scardino in particular are often hilarious to listen to, with more than a handful of funny anecdotes to share. I especially enjoyed the discussion about using the locals for supporting roles in the film. Once again Leicht and company have put together a well edited and insightful documentary for fans! Great stuff! Eureka! With Jeff Lieberman- Running just over 7 minutes, this is yet another fun featurette (once again from Leicht & Shout!) where Director Jeff Lieberman leaves the interview chair and brings us (quite literally) to the home he lived in when he came up with the idea for Squirm. It was nice to hear not only about the films inception, but about Lieberman’s beginnings in the industry. Original Theatrical Trailer- The original theatrical trailer for Squirm runs just under two minutes. I’ve said it before and I’ll say it again, you got to love those voice overs! TV Spot- This vintage television spot runs under a minute and gives viewers a pretty good idea of what they’re in for. Radio Spot- This actual radio spot from the theatrical promotion runs just over a minute and is very effective! Still Gallery- This still gallery plays automatically when selected and features some fantastic color and black and white photographs from the making of the film. More from Scream Factory- Vintage trailers for other titles in the Scream Factory line are presented here including Pumpkinhead, Motel Hell, and The Beast Within. This Blu-Ray edition from Scream Factory features a newly commissioned slip-cover design from Artist Paul Shipper, who also recently worked on their Halloween Complete Collection. The coloring is gritty and perfect, with Roger’s worm-invaded face and Geri’s half naked shower surprise, the selected moments he chose to portray suit the film nicely. On the reverse of the case you’ll find a plot synopsis, a listing of special features, technical specifications, and select production stills from the film. Inside the case is the Blu-Ray disc as well as the amazing original theatrical “skull” poster design available as a reversible wrap. 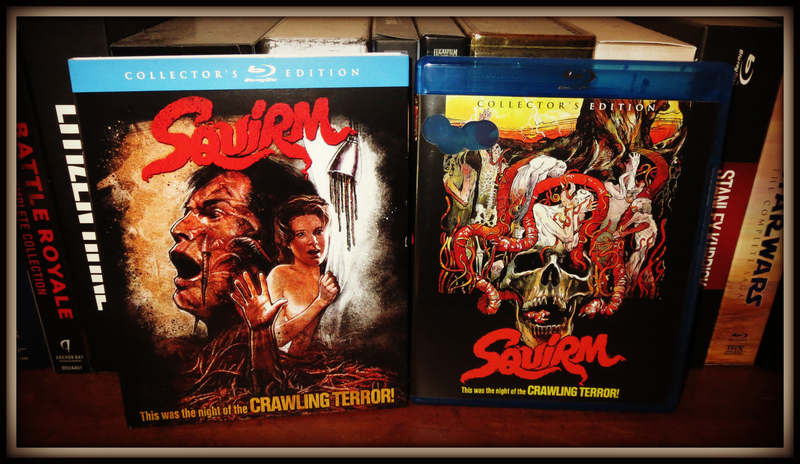 Squirm on Blu-Ray from Scream Factory is creepy, crawly, High Definition gross-out fun! Though I first saw the film as a kid when it was featured on an episode of Mystery Science Theater 3000, the film has its charms with or without the riff-track. Though the B-movie creature feature clearly shows its production budget, the then-amateur cast gives it their all, and the gross-out effects from Rick Baker provide for plenty of barf bag fun. I’m still quite shocked at how incredibly good Squirm looks on this brand new Blu-Ray transfer as well, with nary a blemish to be found and an audio track that works just fine. The special features on this Collector’s Edition are once again a standout aspect, especially with the wonderfully detailed and entertaining Digging In: The Making of Squirm documentary. Squirm fits right in as part of Scream Factory’s ever-growing line of Horror treats, and I enjoyed revisiting the film on this brand new Blu-Ray edition. Recommended! Based upon the factual murders committed by William Burke and William Hare in Edinburgh, Scotland in 1828, The Doctor and the Devils comes from an original screenplay by Dylan Thomas and is Directed by Hammer alum Freddie Francis. The film stars Timothy Dalton as Dr. Thomas Rock, an Anatomy Professor who has been paying local henchman to dig up the graves of the recently deceased for his fascinating lectures at the academy. Jonathan Pryce and Stephen Rea play Robert Fallon and Timothy Broom, two degenerate crooks who get word of Dr. Rock’s grave-robbing business and are looking to make a profit. When finding the right bodies proves to be more difficult than they imagined, they take to killing unsuspecting young lads in the area (as Dr. Rock pays more for fresh corpses). Rumors soon begin to spread about Dr. Rock’s supposed late night activities, and his rival, Professor Macklin (Patrick Stewart), sends student “spies” to attend his lectures to gain proof of his access to dead bodies “not from the hangman.” Dr. Rock makes implications to the macabre shenanigans, but lack of clear proof in the matter holds the authorities at bay. As the murders begin to hit too close to home for Dr. Rock and his assistant, and moral tension mounts between Fallon and Broom, these colorful characters’ lives arrive at an inevitable climax that spells certain doom for all. The Doctor and the Devils has that handsomely produced Gothic feel to it, thanks to Hammer and Amicus alumni Freddie Francis. From the period costume design to the gothic set dressing and talented array of performers giving it their all, the film is exceptionally well executed. Having ignorantly never seen Timothy Dalton outside of the Bond films he made in the late 1980’s, it was a treat to see his genuine commanding presence on display in a period piece. The score by John Morris is worth mentioning as well, with its gothic and mysterious tone that exudes curiosity and stays with you for days. There are also some genuinely disturbing moments in the film, in particular, when Fallon suffocates a young man to death for the first time as he relates how he was asked to put soldiers out of their misery during his time spent as an orderly in the war. Broom pleads with him; “wait Fallon….wait, wait. For God’s sake, wait.” It’s an unnerving scene, expertly acted by both Pryce and Rea. I assure you that you’re in for a fine evening with this one, and this release from Scream Factory makes for a classy addition to their ever-growing line of Horror gems. Though I’ll admit I became a little worried during the 20th Century Fox logo and opening shot of Dalton walking against the Edinburgh skyline (which has its share of debris), it soon after becomes immediately clear that The Doctor and the Devils looks incredibly good on this High Definition presentation. For some reason I see a lot of 1980’s films that have some scratches and anomalies in the opening credits that soon clear up incredibly well (not sure why that is). But let’s get right to it: The Doctor and the Devils retains the authentic natural film grain of the source material, has incredibly solid black levels, and even exhibits surprisingly good detail in objects, facial features, and costumes. There are a handful of seemingly soft or unfocused shots, no doubt a result of the original negative, but worth pointing out. This is a fine presentation that really exhibits a solid upgrade to High Definition. The 2.0 DTS-HD Master Audio mono track is solid, regularly balancing dialogue, background effects, and the lovely score from John Morris in fine fashion. There is some power and depth to the audio that is quite surprising at times, and paired with the great video, it makes for a finely presented experience. Audio Commentary with Steve Haberman– Author Steve Haberman sits down to discuss The Doctor and the Devils in great detail. The commentary is incredibly informative, but comes off a bit too dry and robotic, sounding as if Haberman is reading directly from a script. It lacks the fun, off-the-cuff style of previous commentaries from the Scream line. This is in no way a knock on Haberman, who is clearly an absolute scholar on the film and its history, but it simply comes off a bit dull at times. Interviews- This phenomenal three-way interview has Mel Brooks, Jonathan Sanger, and Randy Auerbach discussing The Doctor and the Devils for nearly 16 minutes. There isn’t a moderator but the trio discusses the film in depth. From Dylan Thomas’ wonderful screenplay to various pre-production issues, reminiscing about filming and the acting talent, and even having the “Mel Brooks” name on a genre film other than comedy. This is very entertaining stuff, and I love the fact that Shout! Factory just let the trio carry on their discussion in their way. Brooks in particular is just so entertaining to listen to, especially when he reflects on the differences in filmmaking from then to now: “But during my time making movies, there were friendships. You could actually ask people for a favor.” Bittersweet and fascinating, this featurette is wonderful. Theatrical Trailer- The original theatrical trailer for the film runs just over 1 ½ minutes and though it’s in pretty rough condition, it offers an accurate glimpse at the type of movie that awaits you. This Blu-Ray edition from Scream Factory features the original theatrical poster design for the film on its cover, looking like a sepia toned sketch from an old book of medicine. The red title font provides a fine contrast to the drawing design, making for simple but effective cover art. On the reverse of the case you’ll find a plot synopsis, a listing of special features, technical specifications, and select production stills from the film. 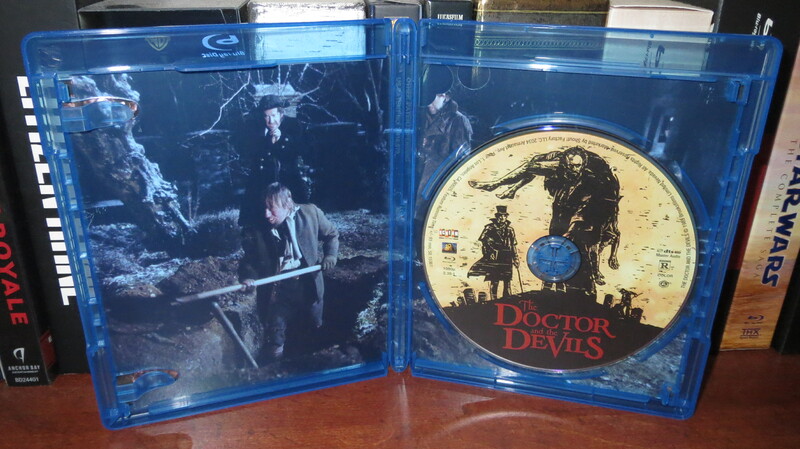 Inside the case is the disc as well as some nice background art featuring a grave-robbing scene from early in the film. The Doctor and the Devils may just be Scream Factory’s classiest film released in their ever-growing line of Horror delights. Masterfully directed by Hammer alum Freddie Francis and featuring fine performances from everyone involved, this polished cinematic version of the Burke & Hare murders is both clever and unnerving. 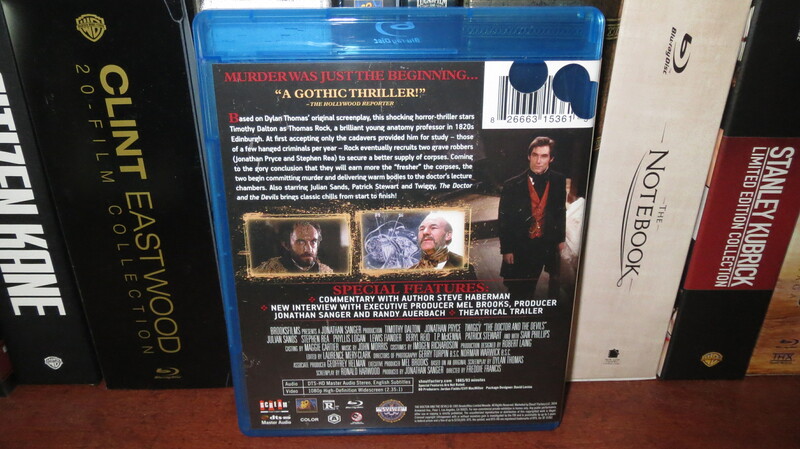 The Blu-Ray edition from Scream Factory features an incredibly solid High Definition presentation, complete with authentic color grading and solid black levels, and the audio is surprisingly well balanced and dynamic. The special features department offers a wonderful conversation with Producer Mel Brooks, Jonathan Sanger, and Randy Auerbach, as well as an informative audio commentary. Though I felt that the included audio commentary was a bit robotic, it’s a small complaint on an otherwise great disc. 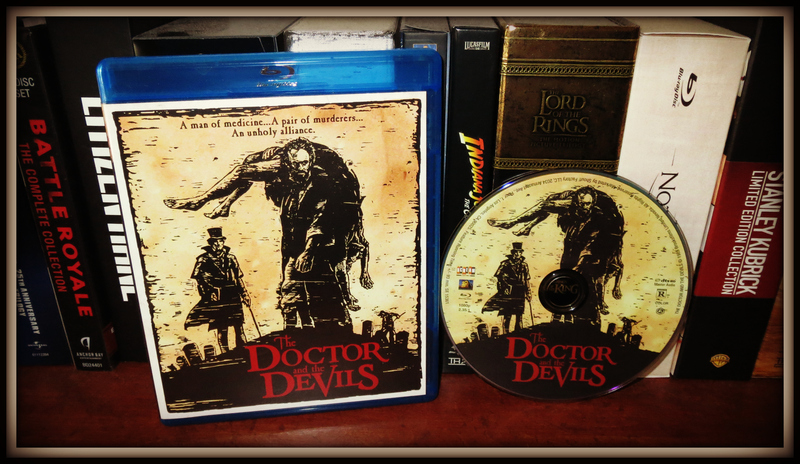 The Doctor and the Devils remains an entertaining and gorgeously produced Gothic Horror entry that reminds one of Hammer films’ heyday, and this Blu-Ray edition comes highly recommended. 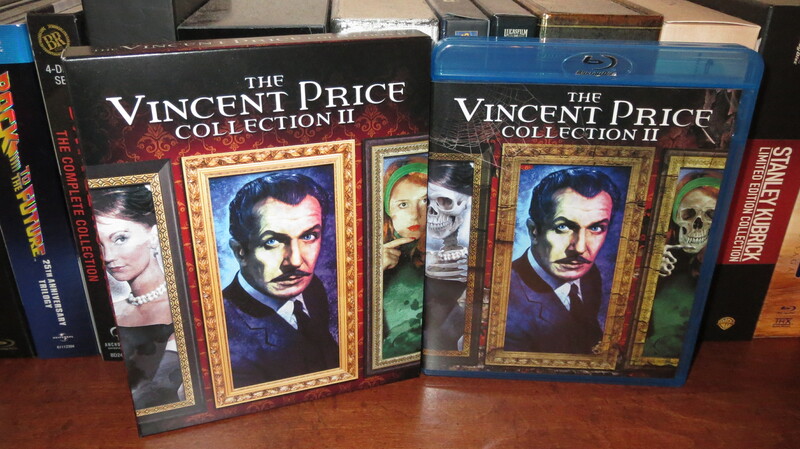 Perusing Scream Factory’s upcoming release for The Vincent Price Collection II brought on two personal revelations: the first being that, without a shadow of a doubt, the distributor’s Vincent Price collections represent the very best in their brilliant catalog of macabre treats. You can simply watch them on any rainy day the entire way through, appreciating the man and his work on so many levels. The selections are diverse, thoroughly engaging, and showcase the artist at his very best. The second revelation would be that there has never been a Horror star quite like Mr. Price. The man knew how to lure the audience into his performance, buy into a film’s concept, and have a frightfully enjoyable time at the movies. He is a legend of the silver screen, and there simply isn’t a better way to enjoy his work than spinning these fine discs from Scream Factory. The Raven (1963)- Resembling very little of the Edgar Allen Poe source material, this reworking of The Raven is a delightful horror comedy from the Corman-Poe adaptations, and along with The Comedy of Terrors, stands out as unique among the films presented in Collection II. Having grown a little tired of the formula and wanting to branch out into the unknown, Roger Corman and screenwriter Richard Matheson decided to make this particular Poe adaptation an all-out comedy, and the result truly works. Vincent Price, Peter Lorre, and Boris Karloff all deliver fine performances here as sorcerers in the 15th century. Price wants nothing more than to have his wife Lenore back, years after she seemingly died. Lorre’s been transformed into a raven by Karloff and comes “tapping” at Price’s window, and the pair soon travels to Karloff’s castle, one to battle with his arch nemesis, and the other to find his wife (who Lorre swears he has seen roaming the castle). Featuring some standout improvised comedy from the trio with oodles of chemistry to delight in, The Raven is just about as good as it gets. This isn’t laugh-out-loud funny, it’s simply “cute” and clever every step of the way. The Comedy of Terrors (1963)- Yet another comedic delight from American International Pictures that features Price and Lorre as partners in the undertaking business. When the rent is due and money becomes scarce, the pair decides to start murdering townsfolk in order to bring in some business. Boris Karloff makes an appearance as the hard-of-hearing Mr. Hinchley, and Basil Rathbone is equally as enjoyable as their landlord. The ad-libs and jokes come fast, exhibiting a similar clever charm in the same vein as The Raven. The Tomb of Ligeia (1964)- The last of the Corman-Poe adaptations is also one of my personal favorites, featuring Price as the grieving and bitter Verden Fell, who has recently lost his wife Ligeia. When he marries again, the spirit of Ligeia seems to haunt the couples’ mansion, unable and unwilling to let her husband move on with his life. Though Corman apparently felt that Price was too old for the part, I think he’s simply wonderful here, conveying the sorrow and rage of the widowed Fell with great believability. The outdoor scenery, atypical for a Corman production, is gorgeous, and the gothic interiors fit well with the Corman-Poe catalog. It’s not a particularly scary film by any means, but the dedication and care is obvious, making for a respectable final Poe adaptation from American International Pictures. The Last Man on Earth (1964)- This is without a doubt the very best screen adaptation of Richard Matheson’s source material, I am Legend. It also might just be my personal favorite Vincent Price film. Mr. Price stars as Dr. Robert Morgan (Neville in the book), the seemingly lone human survivor of a deadly outbreak that decimated the world population, turning those who died from its symptoms into vampires of the night. Three years after the outbreak, Morgan spends his days stocking up on the necessities and hunting down the vampires of his city as they sleep, and in turn, spends his nights defending his boarded-up home from the sinister creatures. Through flashback narrative we’re able to see what Morgan’s life was like before and during the outbreak before he unexpectedly meets a fellow survivor on what appears to be another routine day for him. I won’t spoil too much more of this horror classic, but it’s simply one of the best there is! Price’s narration of his day-to-day routine reel me in every time, and his performance here as a broken man who desperately hangs onto hope is one of his best. To think that Matheson opined that he was miscast in the role is mind boggling. The black and white cinematography is the icing on the cake, as this is impeccably filmed and realized on screen (even with the occasional crew member appearing in the background). I simple love this movie! Dr. Phibes Rises Again (1972)- The master of plagues is at it again, three years following the events of the first film. Dr. Phibes (Price) awakens from a self-induced hibernation with his beloved dead wife, who he soon hopes to awaken with the help of his assistant, Vulnavia (this time around played by Valli Kemp). With his mansion destroyed and the special scrolls he needed for his wife’s resurrection stolen, a new series of inventive deaths are unleashed upon those who get in his way. This time around, the kills fall in line with the Egyptian theme of the story, with sand storms and scorpions, among others, providing for some delectable misdeeds. The sequel to The Abominable Dr. Phibes retains the dark humor of the first film, and is nearly just as fun, with Price truly hamming it up and enjoying his role once again. Though I prefer the original, this one is certainly a lot of fun, with great performances and consistent entertainment. The finale is especially twisted and brilliant. The Return of the Fly (1959)- Released only a year after the original classic, this sequel has Price reprising his role as Francois Delambre, brother to the ill-fated scientist Andre Delambre of the first film. Opening with his sister-in-law’s funeral, Francois tries his best to convince his nephew Philippe to not follow in his father’s footsteps, warning him that continuing his experiments with the teleportation of matter may have dire consequences. Philippe is not easily swayed, taking on a new partner from his Uncle’s company, and diving right back into the teleportation experiments. When Philippe’s new partner double crosses him to turn a profit on the machine, things go awry for Philippe, and a new fly-human hybrid is on the loose! For me, this sequel isn’t quite as engaging as the first film, but still has a lot to offer in terms of entertainment value. The acting is just fine, and though Price’s time on screen is still limited (as it was in the first film), he seems to be having fun returning to his role. The fly-human hybrid effects are just as creepy this time around, and the film moves swiftly and efficiently for the viewer, making for a respectable sequel. House on Haunted Hill (1959)- This William Castle classic has Vincent Price portraying Frederick Loren, a mysterious and sadistic millionaire who, along with his equally creepy wife Annabelle, has invited five strangers to their “haunted house party.” Once the clock strikes midnight, the doors will be locked and everyone will be forced to stay in the house until morning, no matter what paranormal happenings occur within. Frederick has provided each of the guests with a loaded gun (complete with a tiny gun coffin), to add a little more danger into the mix. When strange things begin to occur (including one of my all-time favorite jump scares with the old woman in the basement), trust dwindles among the group, and Annabelle tries to warn the guests that Frederick is psychotic, and that the night that lies before them may not be what it seems. I won’t reveal any spoiler plot details, but the twists and turns in this horror classic make for sheer Halloween viewing delight! This is one of Price’s best performances as well, nailing the passive aggressive and sadistic nature of his character. It’s also incredibly well framed and filmed in glorious black and white, making for a wonderful old school horror experience. Presented in both color and black and white prints, these High Definition transfers all look fairly solid, some even pristine, on the format. The color timing has been properly adjusted when appropriate, and though some titles in the set exhibit some minor print wear and scratches, it’s all part of the fun when it comes to classic Horror! Film grain is always present and authentically produced, and there is some surprising detail in the costume design and facial features across the board. As an admirer of black and white films, I was especially delighted to see the transfers on The Last Man on Earth, Return of the Fly, and House on Haunted Hill handled so well. Contrast is appropriately balanced and detail and grain look beautiful, and the minor scratches and slight imperfections bring the nostalgia back in full force. The color prints on The Raven, The Comedy of Terrors, The Tomb of Ligeia, and Dr. Phibes Rise Again look very solid indeed, with accurately reproduced colors and detail looking nice in the set design and costumes. The color films, particularly The Comedy of Terrors, occasionally suffer from a handful of soft shots (appearing like Vaseline smear), which I’m guessing is likely inherent to the source material. There are no big anomalies or intrusive manipulation here, and the films look better than I’ve ever seen them appear. Fans will be delighted with how good these Horror classics look on the format! Every film in the set features a DTS-HD Master Audio Mono track, and though they’re not likely to challenge your system with power or dynamics, they feel accurately reproduced and get the job done. Dialogue is always clear and discernable, music sounds balanced and undistorted, and background effects and thrilling high points are well maintained on each disc. Scream Factory has given Vincent Price fans a fully-loaded set with some great bonus features to peruse on a dark and stormy night! Rather than bore my readers with a listing of each and every bonus feature found on these individual discs, I’ll simply breakdown some of my favorite material from the set as a whole. With multiple great audio commentaries to peruse featuring the likes of Roger Corman, David Del Valle, and Steve Haberman, those of you that wish to know more about the making of the films and Price’s history working on them will not be disappointed. Del Valle in particular is extremely fascinating to listen to. The Raven, The Comedy of Terrors, and The Last Man on Earth all feature the wonderful Richard Matheson: Storyteller segments which feature the screenwriter/author discussing his work on the films. I especially loved hearing Matheson discuss the Horror greats’ (Price, Lorre, Karloff) collaboration on The Comedy of Terrors, admiring their love for the genre and delight at having some campy fun on set. But my very favorite bonus feature additions to this set are once again the Iowa Public Television Gothic Horrors segments where Vincent Price himself offered introductions and farewell bookend videos to various films in his career. I love seeing Price dressed up, fire roaring, in a secluded mansion as he introduces the viewers to each film. Though there isn’t much in the way of newly produced bonus content, the carried over MGM features and IPT Gothic Horrors segments alone are brilliant enough to recommend. This Blu-Ray edition from Scream Factory features newly-commissioned artwork from fan-favorite artist Joel Robinson on the slip-case, which much like the first collection, reveals the female skeletons in the paintings when you pull out the Blu-Ray case itself. I love Robinson’s vision, and the framed art pieces pay tribute to Vincent’s love for art. On the reverse of the slip-case, you’ll find a listing of special features and technical specifications for all seven films in the set. Inside the slip-case is a beautifully created booklet featuring gorgeous production stills and posters from the various films in the set, as well as a wonderful essay written by David Del Valle. 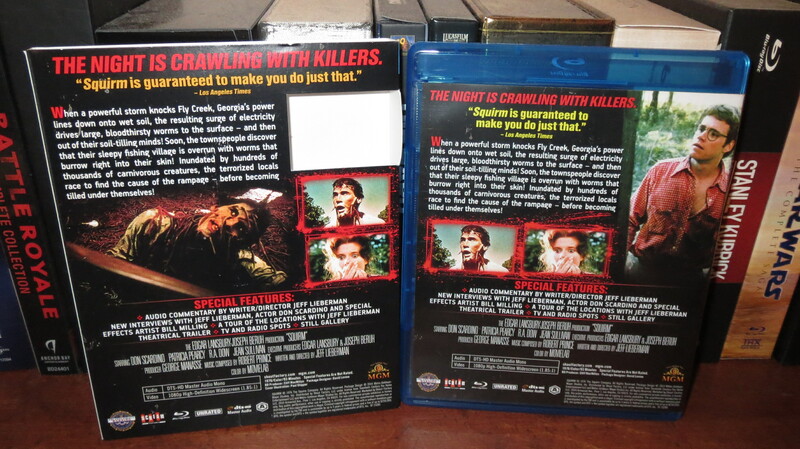 Inside of the Blu-Ray case are the various discs with a classy yet simple design that matches the rest of the set. 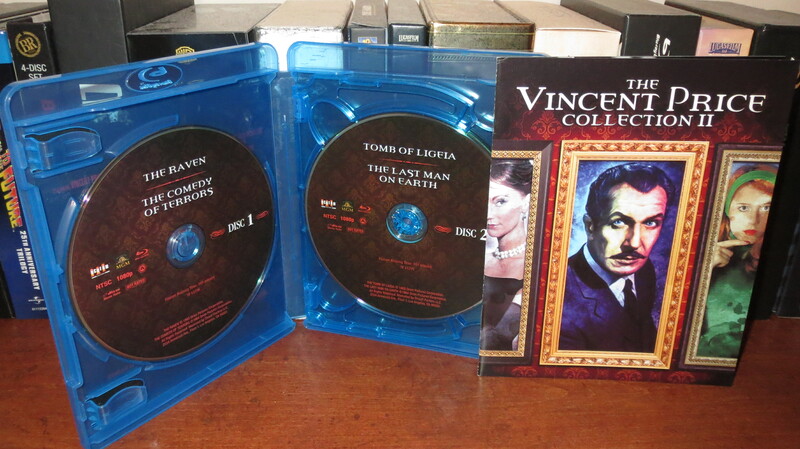 Fans of Vincent Price and his work couldn’t ask for anything better. There has never been, and likely will never be again, a Horror star quite like Mr. Vincent Price. This latest collection, as well as the first, represents the very best of what Scream Factory has to offer. For a fan of classic Horror and an admirer of the late, great, Vincent Price, sitting down to enjoy a marathon of his very best films in High Definition is a dream come true. Scream Factory has loaded these discs with some great special features including several audio commentaries, informative featurettes, and my personal favorite; the continuing additions of Iowa Public Television’s Gothic Horrors introduction segments featuring the man himself. Video and audio quality is overall terrific, rounding out this great package. 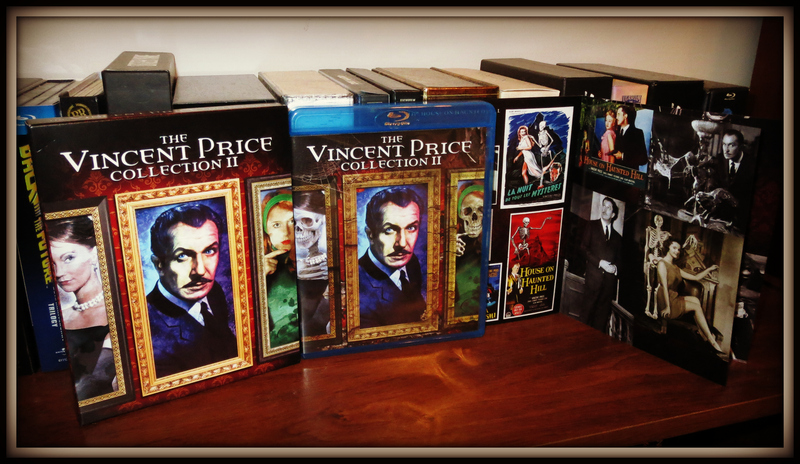 If you’re looking for the perfect Halloween season entertainment, The Vincent Price Collection II receives my highest recommendation.